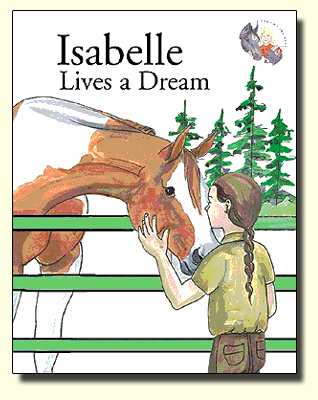 sabelle Lives a Dream is the story of a young lady in a big city who dreams of being a cowgirl. Share her excitement when she wins the school contest to visit Cowgirl Peg's ranch. Travel with her to the mountain ranch where she follows her dream. Learn with her -- not only about horses, but also about setting goals and working to achieve them. Young readers will be wide-eyed with excitement as they project themselves into Belle's adventure in the mountains with Cowgirl Peg, Lacey, and their canine friends Muffin and Jasmine. Isabelle's story is a great illustration of the benefits of setting goals and working toward them. As in Peg's book about Lonesome, the full page illustrations make the story easy for teachers to read to groups of children sitting close by. Isabelle Lives a Dream has been nominated by the Mountains & Plains Booksellers Association for a Mountain & Plains Booksellers Regional Book Award.